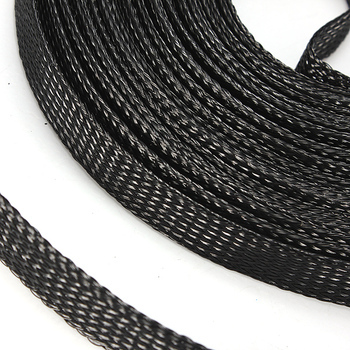 High flame retardant braided sleeving is braided by UL 94 VO grade raw material PET mono filaments. It has excellent expandability, abrasive resistance and high flame retardancy. Its flame rating can be up to VW-1. Application electronics, automobile, high-speed rail,aviation, marine and switch cabinet wire harnessing applications where cost efficiency and durability are critical. The unique braided construction and wide expandability allows quick and easy installation over large connectors and long runs. Ease of installation and nearly complete coverage makes fray resistance braided sleeve an ideal solution for many industrial and engineering applications. 6, Certification: meet the UL, ROHS, REACH, halogen free certification. 1, the braided sleeving has the expandability, lay flat width tolerance is larger. 2, special packaging, special colors, etc, can be customized according to customer's requirements.